Specially created by Alpinestars women’s design department for an optimized female performance fit. Regular/slim cut 13oz denim for a fashionable and long-lasting fit. Interior DUPONT™ Kevlar® fiber reinforcement in seat, hip and knee areas for abrasion and tear resistance in impact critical areas. Internal knee compartment allows adjustment of the certified knee protection to fit various leg lengths. Removable hip pad protectors with Velcro® attachments for secure fit. 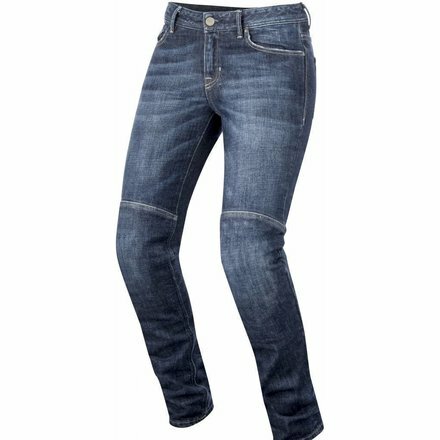 Accordion denim stretch panel on knees and seat area for excellent fit in the riding position. Strong twin stitched main seam construction for added durability. Pre-shaped leg construction is anatomically optimized for specific female riding position. Customized detailing on metal YKK zip, buttons and rivets. Contemporary print design on inner waist and interior pockets. Astars leather belt patch and leather logos on front. Available in international sizes: 24-34.